The Civil Aviation Authority of Vietnam (CAAV) plans to slightly reduce aircraft movements at Tan Son Nhat International Airport in peak hours from 4pm to 6pm to ease congestion this summer. The number of aircraft movements at the nation’s busiest international airport in Tan Binh District would go down to 38-40 an hour from the current 40-42, Dang Tuan Tu, director of Tan Son Nhat airport, told the Daily on July 5. According to a report sent on Monday to the Ministry of Transport, the airport has 51 parking slots for aircraft, including 49 for commercial flights and two for emergency cases. Due to a lack of parking slots, many jetliners are seen parked on the taxiways overnight. The international terminal at Tan Son Nhat is designed to serve 10 million passengers a year and the domestic terminal 13 million passengers. Last year saw 16 million passengers going through the domestic terminal alone and the figure is forecast to rise to 19.8 million this year. Tu said besides overload at the terminals, the number of flights shot up to 630 a day between June 16 and 22, and even 663 on June 17. He said during this summer’s peak the airport will likely handle 750 plane movements a day, higher than the peak travel season around the Lunar New Year holiday, or Tet. Therefore, many planes are often forced to circle the airport to wait for their turns to land. Meanwhile, construction work is underway on streets leading to Tan Son Nhat and at nearby apartment buildings, causing traffic jams on the roads outside the airport from 10:30 am to 11:30 am and from 4:30 pm to 6:00 pm every day, Tu said. The situation will worsen when it rains, with vehicles queuing in long lines in front of the terminals. According to data of CAAV, Vietnam’s airlines had operated 124,000 flights as of June 25. Flight delays and cancellations had accounted for 15.7% and 0.6% of the total, up 1.1 percentage point and 0.1 percentage point year-on-year respectively. Therefore, CAAV plans to cut aircraft movements at the airport in peak hours. Tu said the number of jetliner movements would be cut to 38-40 between 4:00 pm and 6:00 pm. However, any adjustment should be decided by CAAV. A representative of an airline told the Daily that a number of aircraft have to circle the airport for 30-60 minutes before they are allowed to land. CAAV’s plan to make adjustments between 4:00 pm and 6:00 pm would affect carriers’ flight schedules since they have sold tickets to customers. He added the management agency and Tan Son Nhat airport must treat airlines fairly when reducing aircraft movements. 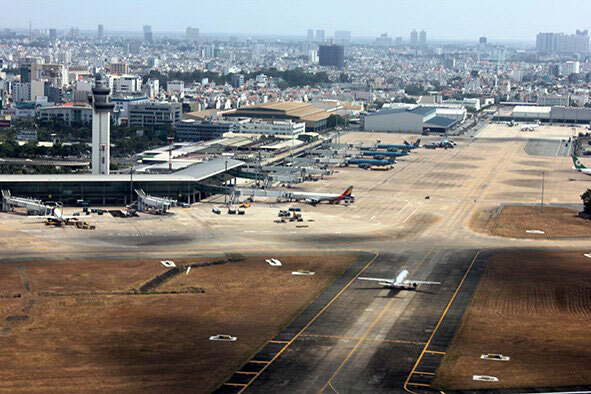 The Ministry of Transport will continue proposing the Ministry of Defense hand over 30 hectares of land to the authority of Tan Son Nhat airport to implement terminal and parking slot expansion projects to meet surging air travel demand in the coming years./.